Color Guard: Blue Devils (17.5), July 14, Minneapolis, MN Open Class: Brass: Vanguard Cadets (16.6), July 15, Bellflower, CA Percussion: Blue Devils B (16.6), July 15, Bellflower, CA Color Guard: Vanguard Cadets (15.2), July 15, Bellflower, CA View all scores and recaps. Storylines to watch • Blue Devils are on a nine-show winning streak, and the sole World Class corps that has the chance to pull off an undefeated season. • Carolina Crown's 14-show winning streak — the longest in the organization's history since becoming a World Class corps in 1994 — was put to an end July 14 in Minneapolis falling behind the Blue Devils by half a point in the two corps' first matchup of the season. • In Minneapolis on July 14, the Boston Crusaders went ahead of the Cavaliers for the very first time since the 1978 DCI World Championship Prelims in Denver. Coincidentally, Boston had outscored the Cavaliers at that show in '78 by two tenths of a point just like they did Saturday in Minnesota. Keeping things interesting, the Cavaliers would go back ahead of Boston by seven tenths of a point just a day later in Rockford, Ill., 78.55 to 77.85. • Green Machine in motion: After falling behind in every head-to-head matchup with the Madison Scouts so far this season (by as many as 2.1 points), the Cavaliers popped a score 0.9 ahead of the Scouts on July 14 in Minneapolis. After falling 0.6 behind Spirit of Atlanta on July 7 in Kalamazoo, Mich., the Cavaliers were 0.6 ahead of Spirit of on July 9 and an even greater 2.1 points in Minneapolis. The Cavaliers will next face Madison and Spirit on July 21 in San Antonio. • While the Cadets have taken the top score in the three head-to-head matchups between themselves and Phantom Regiment, Regiment has been trailing behind by just a hair, 0.15 points in Minneapolis on July 14, and 0.25 points on July 15 in Rockford, Ill.
• Legends walked away top dog in Open Class competition at DCI Minnesota on July 14. 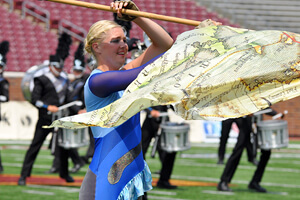 The corps had a 1.4 cushion, besting Music City for the first time since 2010 in Johnsonburg, Pa., when they came out ahead by sixth-tenths of a point. • Blue Devils B has kept its undefeated streak in tact over seven events this season but only by a razor thin margin. The Vanguard Cadets were just 0.05 behind BDB on July 14 in Mission Viejo, Calif., and 0.1 behind on July 15 in Bellflower, Calif. The two corps will not face each other again until July 28 in Paw Paw, Mich. • Blue Devils B and the Vanguard Cadets are the only two Open Class corps to have scored above 80 points this past week. Both Spartans (79.20) and 7th Regiment (78.90) came relatively close on July 15 in Manchester, N.H. • Three additional World Class corps made the jump past 80 points in the last week. Joining Blue Devils, Carolina Crown and the Cadets in the "80 Point Club" is Santa Clara Vanguard (July 10, Waukee, IA), Phantom Regiment (July 11, Metamora, IL) and Bluecoats (July 14, Minneapolis, MN). The Madison Scouts came close on July 12 in Salem, Wis., scoring 79.70. The Blue Devils and Carolina Crown are the only two corps to have scored above 85 points. Both achieved the feat on July 14 in Minneapolis scoring 86.3 and 85.8 respectively. • Based on averaging total scores over the last week, the top 12 corps at the World Championship Finals would potentially be: 1. Blue Devils, 2. 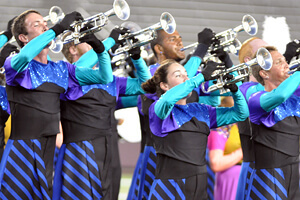 Carolina Crown, 3. The Cadets, 4. Phantom Regiment, 5. 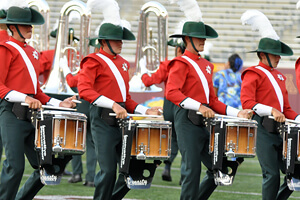 Santa Clara Vanguard, 6. Bluecoats, 7. 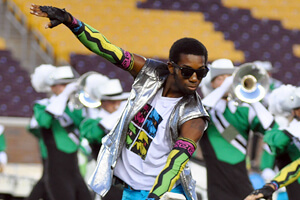 Madison Scouts, 8. The Cavaliers, 9. Boston Crusaders, 10. Spirit of Atlanta, 11. Blue Stars, 12. Blue Knights. This grouping is the same 12 corps that made the top 12 in 2011. 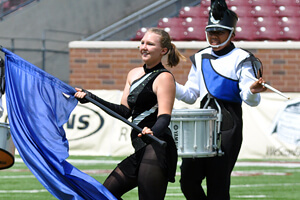 • Don't count anyone out: Last season's DCI World Champion Cadets, were all the way down in fourth place after the 2011 edition of DCI Minnesota. In just a few weeks time, the corps would climb to third in San Antonio, second in Atlanta and second in Allentown, before driving the nail in the coffin and winning all three nights of competition at the World Championships in Indianapolis. 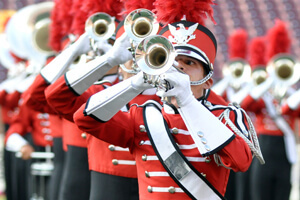 • In the fifth week of the 2012 Drum Corps International Tour, corps that will be making their first performances of the season include: Forte (July 19, Denton, TX), Genesis (July 17, Bentonville, AR) and Revolution (July 19, Round Rock, TX). 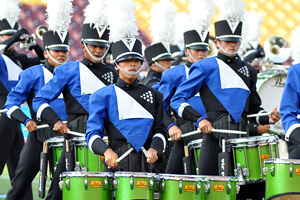 Friday, July 20 Houston, TX Saturday, July 21 San Antonio, TX Sunday, July 22 San Antonio, TX View the complete 2012 DCI Tour schedule. Photos by Jessica Skogh.